Establishing a rapid definitive diagnostic testing for Marek’s disease in California backyard chickens to help curb the spread of the disease. Marek’s disease is highly contagious in poultry and is caused by a herpesvirus that attacks nerves and causes paralysis or widespread tumors. Understanding the wellness benefits of natural feeding behavior in Amazon parrots. Wild parrots spend a big part of their day finding edible plants, picking fruits or grains, and removing skins and shells for food. But companion birds are often given ready-to-eat food and spend little time acquiring meals. Behavioral problems may improve when birds spend more time feeding. Analyzing different methods for administering buprenorphine in guinea pigs. Buprenorphine is used as a pain medication to aid in the treatment and recovery process. Another project examines the effects of buprenorphine and the pain medication hydromorphone in cockatiels. 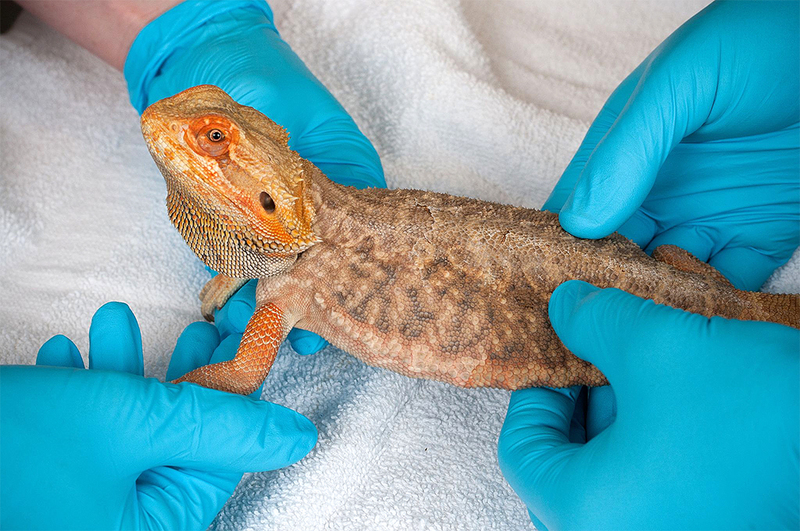 Examining the use of ultrasound in improving the health of bearded dragons. Researchers found that using ultrasounds on the main body cavity is a valuable imaging tool for assessing most organs in bearded dragons, and can be performed in animals that aren’t sedated. The technique and description of findings in normal animals helps detect abnormalities in sick animals. Exploring the effects of ceftiofur crystalline-free acid (CCAF) antibiotics in red-tailed hawks and rabbits to determine their effectiveness over time. These animals are easily stressed, so if CCAF proves effective for a few days, rather than a few hours, that means the medication can be administered less often, reducing stress.